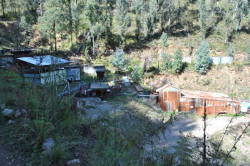 The Sambas Gold Mine in Harrietville has been included in the Victorian Heritage Register. The Sambas reef was struck in 1910.The terrain of the Upper Ovens Goldfield meant that the quartz reefs at the Sambas Mine were worked almost exclusively by horizontal tunnels dug into the hillside (referred to as ‘adits’, a Cornish mining term) rather than the vertical shafts seen in the flatter gold mining landscapes around Bendigo and Ballarat. The Upper Ovens Goldfield was unusual because new and profitable quartz reefs continued to be discovered well into the twentieth century. During the 1950s, the Sambas Mine was by far Victoria’s richest small gold mine. The Sambas Gold Mine is historically significant because of it is association with gold mining in Victoria and the particular adit mining techniques evident in the Upper Ovens Goldfield and other mountainous areas of Victoria. This relatively intact palimpsest of mine workings is a rare example of a once widespread form of mining carried out in the mountainous regions of the state. It now is the oldest working mine of its type in Victoria. It is notable for its wide range of crushing and processing technology on display, such as a working stamp battery and rod mills. All elements of the mine are located in close proximity to each other on a small site allowing an understanding of the operations of a small mine. More information on recent registrations can be found here.